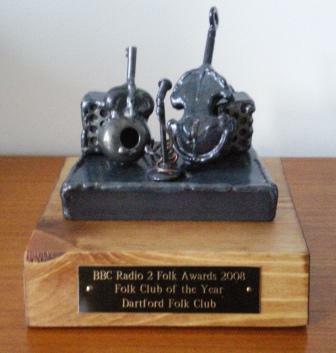 DARTFORD FOLK CLUB was honoured to receive the prestigious "FOLK CLUB OF THE YEAR" award in 2008!! 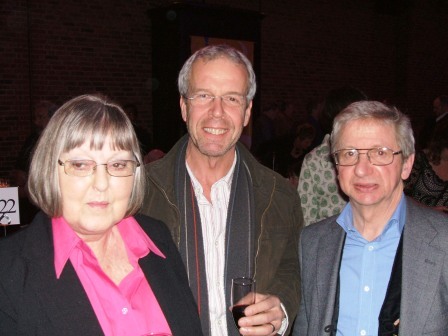 Colin Searle and Paul Homer accompanied them to the event. 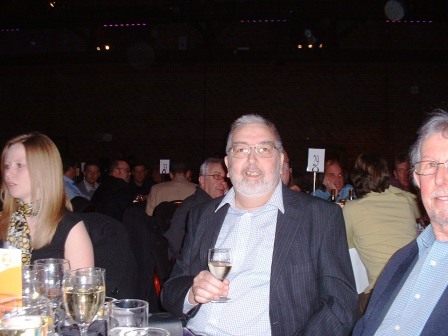 The following report was compiled by Paul and Colin, shortly after attending the Awards event. 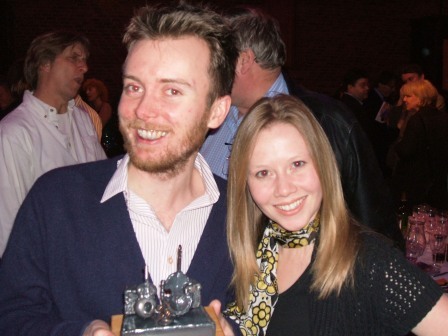 I could hardly contain myself when Pam emailed me with the news that the club had won the award. I was so pleased for Pam and Alan that a congratulatory reply as slow as an e-mail seemed inappropriate. So I phoned. 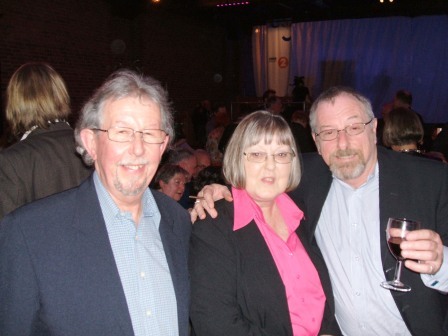 In that phone call I was honoured to be invited as one of Pam and Alan’s two guests at the ceremony to be held at The Brewery, Chiswell Street. Colin was their other guest. One of the main problems (apart from finding a couple of bits of formal ware I could squeeze into) was keeping silent about the whole affair. There was an embargo on breaking the news until the event had taken place. We arrived at the Thistle Barbican Hotel early afternoon. Already, many leading lights of the folk world were there including Martin Carthy, Phil Beer, Allan Taylor, Tom McConville and John Tams to name but five. We found our rooms. Colin had the misfortune of having to share a room with me. However, the single beds were far enough apart - not causing any embarrassment from or to either party! We joined Pam and Alan in the bar area for tea and coffee. A fine thing to do apart from the fact it cost over £2.85 a cup. These professional folkies DO live in a different world! Then it was time to put our other gear on and walk down to the Brewery. Waiters with trays of bubbly greeted us as we made our way into one of the halls. An immense place with some of the largest spans of roof supporting beams in the country! We were pleased to see Mike Silver and inspect his carpal tunnel surgery scar which thankfully is healing well! 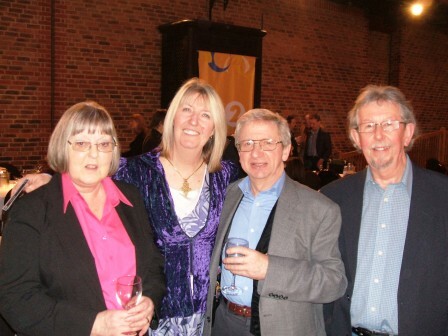 Many people who know Pam and Alan and the club made their way to our little group. 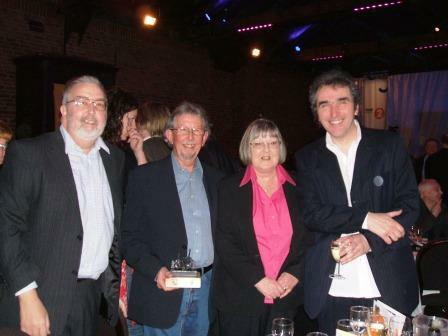 This included Steve Tilston, Johnny Coppin and Nick Barraclough. Next to us, a circle of thespians including Bob Hoskins and Brenda Blethyn were chatting. Bob Harris and other luminaries drifted by. Both Colin and I had come equipped with cameras but it seemed a bit rude and anorakish to start flashing at everyone at this stage. I also spoke to Graeme Taylor (John Tams Band, Home Service and many more) who revealed that he is now part of The Omega 3 (A trio who appeared at the club in 2007). Megson pose with Dartford's trophy! Mike Harding took to the stage and instructed the audience to make plenty of noise during the applauses. The nominations, speeches and award acceptances were interspersed with some fine music from fairly new to well established acts. 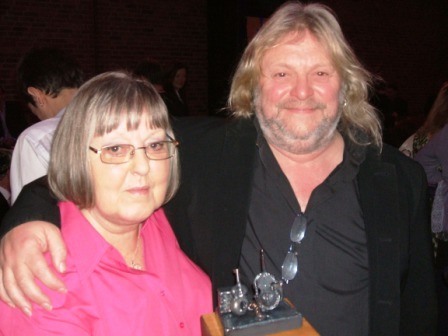 Half way through, it was the turn of Pam and Alan to make their way through the clapping and cheering crowd to be met on stage by Jez Lowe. A superb acceptance speech was made by Alan. To be quite honest, it outclassed the efforts of some of the professionals. Paul Homer soaks up the atmosphere with a glass of water! The formal ceremonies came to an end and a whole load of artists, promoters and other well wishers made their way over to congratulate Pam and Alan on their success. I eventually plucked up enough courage to get the camera out and took a few pictures as did Colin. Carriages waited to transport us back to the hotel. However, we decided that the ten minute walk back after the exuberance of the night’s events would help bring us back to ground level. The party at the hotel was already in full swing. We found some comfy sofas to enjoy our nightcaps of lager and coffee and more visits by well wishers. A superb evening in a different world! How on earth do we get tickets for next year? ! Alan Coll's Acceptance Speech A Masterpiece! Definitely worth a read! !